Sarah Fontenot is both a nurse and an attorney. 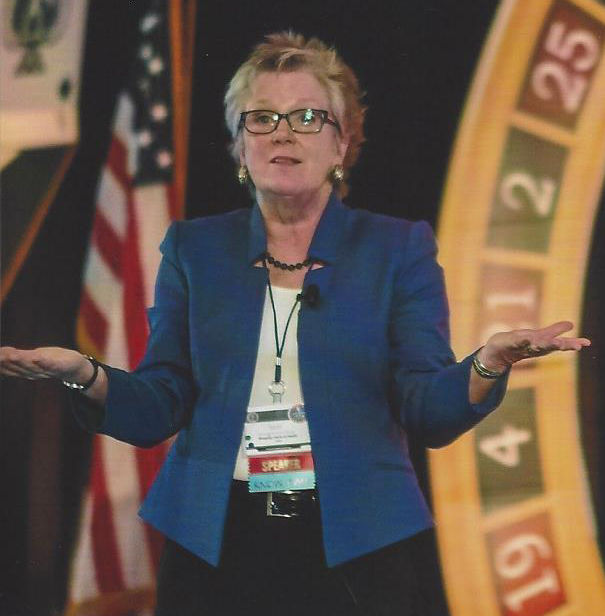 Today, as a professional speaker, she travels the country helping people understand how health care is changing and what those changes mean for them as providers, patients or policymakers. Since 1997, Sarah has been the Adjunct Professor for health law in the Department of Health Care Administration at Trinity University (San Antonio). Her prior academic positions include teaching hospital law and public health law at the Yale School of Public Health (1992 – 1994) and conducting the health law component of the Certificate in Business Administration for Physicians program jointly sponsored by Auburn University and the Southern Medical Association (2002-2008). Over the last two decades (plus) Sarah has taught extensively for multiple national provider groups, including the Texas Medical Association [TMA], the Southern Medical Society [SMA], the American Medical Association [AMA], the Arkansas Medical Society [AMS], the American Academy of Medical Administrators [AAMA], the Professional Association of Health Care Office Management [PAHCOM], the Southern Oncology Association of Practices [SOAP], Texas Medical Liability Trust [TMLT], the American Association for Physician Leadership [AAPL], and its predecessor the American College of Physician Executives [ACPE]. A faculty member for the American College of Healthcare Executives [ACHE] since 2007, she continues to teach in multiple programs for that organization. Sarah earned a JD from the University of Connecticut (1990) and was an Associate at a midsized law firm in central Connecticut. She has a bachelor’s degree in nursing from the University of Vermont (1978) and spent six years as a staff nurse in both Massachusetts and Texas. In 2014 Sarah was awarded the designation CSP (Certified Speaking Professional©) from the National Speakers Association. Fontenotes, Sarah’s twice-monthly newsletter, provides concise information about our health care system and is republished as a member benefit by several professional organizations. Fontenotes currently reaches an average of 25,000 readers. Sarah serves on the Board of Directors of Peterson Health in Kerrville, Texas and lives with her family in Fredericksburg, Texas. decades. Her twice-monthly newsletter “Fontenotes” provides concise information about our health care system and currently reaches 25,000 readers. Sarah is a proud member of the Board of Directors at Peterson Health in Kerrville, Texas. "Sarah has consistently proved herself to be articulate, responsible, and effective in her content."